Stained glass is a typical element of décor in the sanctuary of a synagogue. But upon entry into a synagogue, the stained glass windows usually aren’t what people notice and or give strong consideration to, at least at first. When people do look at stained glass windows, they tend to think of the richness of the colors and admire the imagery portrayed. They may not always think of the history of stained glass windows, especially those that are installed in synagogues because usually the image and significance of the image are foremost in people’s minds. Synagogues have used Jewish stained glass windows to honor religious stories for many years, and in some synagogues, the stained glass windows are famous because they are completed by master artisans. In America, the use of stained glass in synagogues dates back to the 1800s. These windows were created by celebrated artists, but also by anonymous craftsmen who showcased scenes from the Bible, the plants and animals of the Holy Land and even the six-pointed Jewish star. Across the country, Jewish congregations in the United States are looking to restore windows that showcase biblical stories with brilliant, beautiful stained glass. In Brooklyn, New York, the Congregation Beth Elohim includes stained glass windows that are part of a building that was constructed in 1909 and the congregation highlights the beauty and storytelling power of its stained glass window. In the 1880s, Adath Jeshurun built a grand house of worship at what was then Congregation Kahal Adath Jeshurum, which included multiple stained glass windows; now the members of the Museum at Eldridge Street, as it has been renamed, looks to preserve the 16-foot window that depicts the Ark. At the B'nai Abraham Synagogue in Virginia, Minn., congregation members have worked to restore 13 stained glass windows in the 109-year-old place of worship. These windows were installed in 1908, and have brought beauty to the community, even through times of dwindling membership. Recently, the Friends of B’nai Abraham Synagogue received a grant to aid their efforts to restore a stained glass window to use as a focal point of the new B’nai Abraham Museum and Cultural Center. In Israel’s Abbell Synagogue at the Hadassah University Medical Center, stained glass windows created by one of the world’s most famous Jewish artists Marc Chagall transform the area into a place of color and light. The windows were dedicated on February 6, 1962. There are 12 windows within the synagogue, inspired by specific passages in the Bible, particularly Jacob’s blessing of his 12 sons in Genesis 49; Moses’ blessing of the Twelve Tribes in Deuteronomy 33 and the description of the high priest’s breastplate in Exodus 28:15. The colors of each section – the northern and western views, eastern and southern views, correspond to rows of stones in the breastplate: the first row is colored in tones of carnelian, topaz and chrysolite; the second of moonstone, sapphire and emerald; the third row of jacinth, agate, and amethyst; and the fourth row of beryl, onyx, and jasper, set in filigree. Stained glass windows have a special significance in religious history, and if you’re interested in designing a trip around synagogues with stained glass windows or a tour of Israel to learn more about religious history, the professionals at Gil Travel can help. 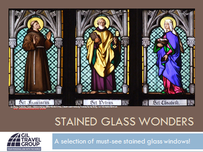 For more beautiful stained glass windows, download our stained glass windows guide below!